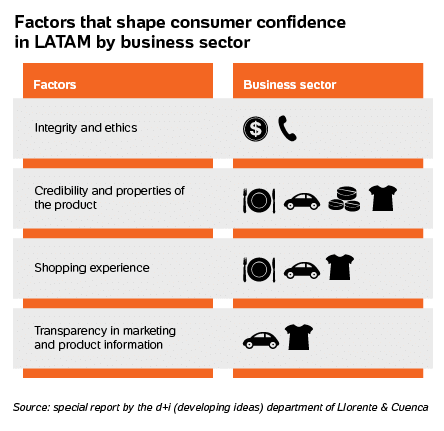 Consumer trust in the LATAM market is slowly but surely rising. According to a study by Statista that compares the 4th quarter of 2016 and the 2nd quarter of 2017, the confidence index went from 83% to 85% in six months. Even though the lack of trust in the payment system is one of the main barriers to e-commerce in LATAM, having its own set of "rules" to be addressed, it?s not something that by itself defines the overall confidence index. It?s one part of a larger context. That said, a key factor to keep these numbers rising is to develop local solutions for your business. Promoting a local customer support service. Part of what makes LATAM such an appealing market for implementing an online platform is the fact that its consumers are increasingly more in touch with new technologies in all areas of life. Statistics show that the daily time spent online per capita (using a mobile device) in 2018 was expected to be around 104.4 minutes. Being the country with the highest internet penetration rate, Chile is also the most distrusting, according to a study conducted by Llorente & Cuenca and based on almost 4,000 surveys across nine LATAM markets (Argentina, Brazil, Chile, Colombia, Ecuador, Mexico, Panama, Peru and the Dominican Republic). One of the reasons pointed out for this apparent "non-sense" is the climate of hyper-transparency set upon companies in this context of higher internet access. More scrutiny: from the veracity of the information given about the product/service to the honesty of the buying process. Everything is being watched and reviewed by everyone. As a result of this, in a fast-growing online market like LATAM, companies have to be on their toes in what concerns client care and procedures, putting an emphasis on honesty in all steps of the process in order to gain consumer trust. What makes Latin Americans trust? This brings us to an important question: what factors build consumer confidence? The quality of the product as well as the shopping experience come to mind first. But there are other less obvious factors, like integrity and ethics. These are especially important when applied to business sectors from which consumers demand more transparency and honesty, such as financial and telecommunications services. 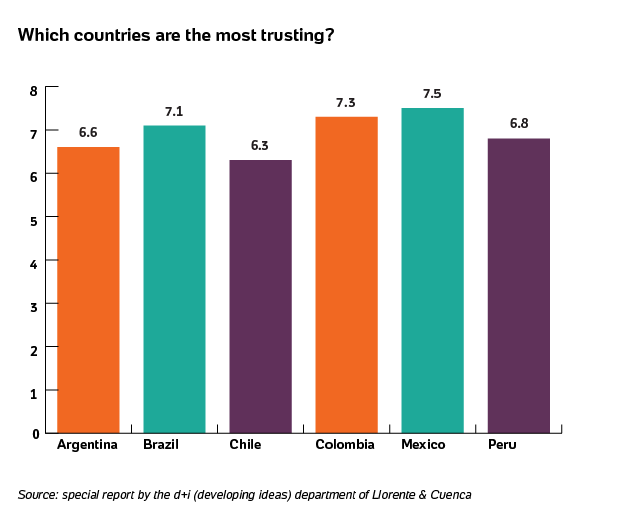 Who do Latin Americans trust? The study conducted by Llorente & Cuenca cross-referenced the above mentioned nine LATAM markets with six business sectors: food & drink, retail, pharmaceutical, automotive, telecommunications and financial services. The conclusion was that the overall consumer confidence index in LATAM is 7.1 (on a scale of 1 to 10) and only telecommunications and financial services are considered vulnerable in terms of inspiring trust. The most trusting country is Panama and the least trusting, as mentioned, is Chile, with an emphasis on the pharmaceutical industry as the one inspiring more suspicion to Chileans. For the purpose of this article, we?ll only be focusing on the main economies of Latin America: Argentina, Brazil, Chile, Colombia, Mexico and Peru. Responsible use of personal data and protecting privacy in telecommunications. If businesses are aware that these factors do matter to an increasingly more demanding and informed consumer, they will be aligned with one of the most powerful driving forces for growth in LATAM: a solid trust relationship with the client.